Daffodil coaster. Crochet cottage chic spring flowers doily table mat place mat hot pad in cream and yellow. 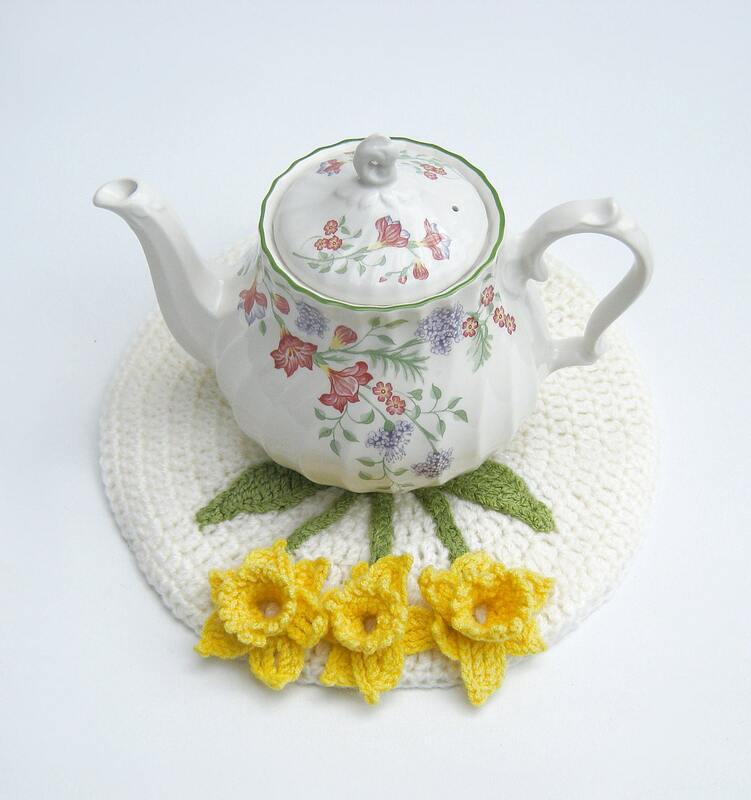 This beautiful teapot stand has been crocheted in chunky cream yarn in a circular design adorned with three crochet daffodils in sunshine yellow complete with stalks and two leaves. The mat is 2 crochet circles crocheted together so that it is double thickness to protect your table from the heat of the teapot. The perfect addition for any tea party, this mat is large enough to fit most size teapots. This crochet mat would also be ideal to stand a vase of flowers or a precious ornament on. Folksy :: Buy "Limestone and Yellow Crochet Doily / Coaster"
Folksy :: Buy "Cotton Candy Floss Pink Crochet Doily"
Folksy :: Buy "Crochet Set of 4 Electric Pink, Green & Blue Doilies / Coasters"
Folksy :: Buy " ORANGE/ PEACH CROCHET TABLE MAT/ NAPKIN/ DOILY"
Folksy :: Buy "Frothy Coffee Brown Large Crochet Doily"